IntertopsCasino.com continues its 10th birthday celebrations this month by awarding first-class trips to the casino capitals of the world and by launching five new games. Everyone playing at the renowned online casino in May is automatically entered in a free draw for one of two first-class travel packages valued at $10,000 each. One European player will be flown to Monaco and an American winner will be the online casino’s guest in Las Vegas. The world’s first online gambling company is making all the arrangements First Class: first class flights, a suite at the Bellagio (or equivalent in Monte Carlo), show tickets, chips and spending money. As it does every month, IntertopsCasino will add several new games to its existing portfolio of 350. On May 6th, Microgaming’s new Cashapillar, HoldEm High, Sure Win, Alley Cats and Quest for Beer slot machines will be released. Cashapillar is a cute 5-reel, 100 pay-line video slot that will "worm" its way into players’ hearts with its massive jackpots - up to 6,000,000 coins in the free spins feature. The Trivia 500 promotion was so popular last month that IntertopsCasino.com is extending this chance to win bonuses through May. A game in itself, Trivia 500 gives players a chance to win bonus money by answering trivia questions. 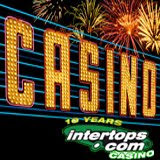 Two $10K casino trips, five new games, and a special bonus trivia game may seem like a lot of celebrating for one month but IntertopsCasino.com vows to continue its tenth birthday celebrations again next month.